Over time, the elasticity in our skin begins to gradually deteriorate. A jaw line that was once firm and supple, begins to sag and droop while every expression leaves a lasting mark embedded in our face. Natures gradual process of aging combined with excessive exposure to environmental elements not only cause our skin to show loss off firmness, but also our radiant glow starts to gradually fade as well. These changes happen gradually and subtly over time and while some may wait until it’s time for an invasive procedure, there are others who chose to reverse this aging process before it gets worse. If you’re not yet ready to consider invasive procedures such as facelift or endoscopic brow lift and fillers aren’t quite giving you the youth you’re looking for, then Thermage CPT may be the solution for you. Thermage CPT is the only non-invasive procedure that helps tighten and contour your skin in one single treatment- no surgery and little to no downtime! Thermage CPT utilizes a unique radio frequency technology to safely heat the dermis, while simultaneously cooling the epidermis. 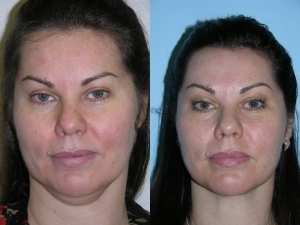 This combined treatment is key to minimizing recovery time following the procedure. By heating the subcutaneous layers of skin found under the epidermis, Thermage CPT stimulates your body’s natural renewal process causing it to increase collagen growth, helping to tighten sagging or loose skin, naturally giving you a dramatically smoother, sleeker and younger look and feel. Over time, sagging skin is replaced by smoother, tighter skin with an overall improvement in tone and texture. 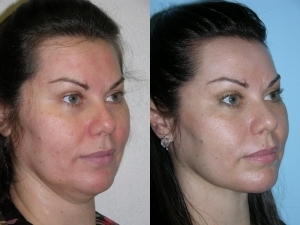 In many instances, Dr. Salomon performs Thermage in combination with Botox and fillers such as Juvederm and Voluma XC. While Thermage tightens and rejuvenates the overall collagen levels in ones skin, Botox and fillers are used to enhance the areas around the eyes and fill the deep marionette lines around the mouth. Thermage CPT can be performed on the face, eyes, and body to give you an overall younger & more radiant look. Schedule your complimentary consultation to learn if you’re a candidate for Thermage CPT. 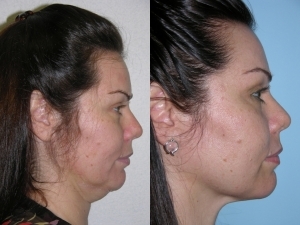 The patient below is shown before and three months after Thermage and fat grafting done by Dr. Jhonny Salomon.